» Bill Pronzini on RICHARD ELLINGTON. Bill Pronzini on RICHARD ELLINGTON. I was pleased to see your posting on Richard Ellington. In addition to being one of my favorite P.I. writers of the late 40s and early 50s, I got to know him personally in the mid 70s when he submitted a story to an MWA anthology Joe Gores and I were editing. The story, “Goodbye, Cora,” which is set on St. Thomas, appears in Tricks and Treats (Doubleday, 1976) and was Ellington’s last published fiction. Duke, as everyone called him for the obvious reason, did indeed own and operate a small hotel on St. John, located on Gallows Point in Cruz Bay. The hotel is still there, though the new owners have expanded it into an upscale resort to take advantage of spectacular sunset and ocean views. Marcia and I had the pleasure of staying at the Gallows Point Resort during a combination vacation and research trip five years ago. The restaurant there is called Ellington’s, no doubt as a tribute to Duke and his wife Kay. The work involved in running a hotel is the reason he did very little writing during the last three decades of his life. 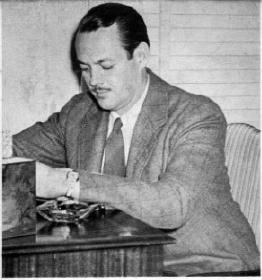 Though he did mention in a letter that he’d been working on his autobiography off and on for many years, chronicling his life as a soldier, theatre and radio actor, radio announcer, radio and mystery writer, and hotel owner. The rather unwieldy title was Fathead, or “The Story of a Man Born the Year World Changed and Who is Now Going Like Sixty.” As far as I know, he never finished it. More’s the pity. After Gores and I took “Goodbye, Cora” for Tricks and Treats, Duke invited us and our then wives down to Gallows Point for a free week’s lodging. We’d planned to accept, but for one reason and another the plans failed to materialize; so I never had the pleasure of meeting him in person. More’s the pity on that score, too. If he was anything like his letters, which I still have, he must have been quite a raconteur. Attached is a photo of Ellington, from the back of the Exit for a Dame dust jacket. As for his being quite the raconteur, probably so: I do recall the warm welcome he gave a young science-fiction writer and his wife long ago — we weren’t guests there, just drop-ins for the day, but we spent a couple of hours there enjoying free drinks and a lot of shop talk.